What’s permanent? 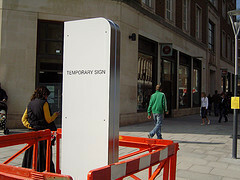 What’s temporary? Perceptions of time frame the way we work together. To be honest, it wasn’t much of a debate. We all agreed on the big stuff – that projects and services overlap; that we all need to work together to deliver value; that people and skills matter more than standards and controls. A lot of motherhood and apple pie really. Boring. Throughout the debate, I felt we were missing something. There was a big divergence in our underlying mindsets; we just weren’t getting at it. Afterwards, I realised this was due to the framing of the debate.